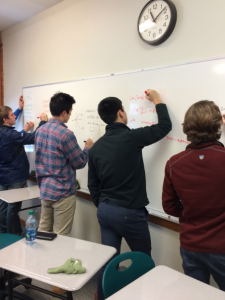 Teaching Calculus to seniors and a few juniors, I feel an obligation to help move them toward independence and self-sufficiency in their learning. I want them to learn to support themselves as learners and know how to reach out for assistance. I use two primary methods to this end. First, I provide full solutions for all homework. Students are expected to use these solutions to check their work as they complete each problem to be sure they not only have the correct answer, but more importantly, that they have supported their work appropriately. The other way they can use these solutions is as a hint on how to start a problem if they just need a little help. No one should come to class with a blank homework saying they did not know how to do the work. With this, they know when they need help and are expected to ask for it. My second strategy for student increased independence is to have all students at the boards at the same time to do problems together. By being visible, at the boards, they can and should look to others around them to confirm they are headed in the right direction. Each student becomes a source of information for everyone else. Students who might not take the lead sitting at their desks are now asked for help by their peers. Again, no one is left unable to start a problem. Help is all around. At a recent math department meeting each teacher was asked to write about something that went particularly well in the first trimester. Here’s what they wrote! Ms. Evelti: I had a student who came into my Video Game class reluctantly, unsure if she would be interested in the work. She ended up really excelling in the class both in the technical and creative aspects of the work. She brought humor and visual interest to the stories behind her games while challenging herself to include difficult interactive elements in her projects that extended and deepened her understanding of the topics we covered in class. Mr. Seamon: As we moved into a different system for graphing (polar coordinates), I worried about the transition. It’s a reorientation of how to look at the basic space we’ve been working in and it’s been a challenge in the past to communicate the new “up” and “down”. This year I tried bringing in a scene from a science fiction classic (Ender’s Game) and it went over quite well, even though most of the students hadn’t read the book! Having a concrete picture of our new space for differentiation and integration has translated into a deeper understanding on the part of the students which has been expressed through impressive board work and high quiz scores. Ms. Schneider: One of my favorite things to do in class is play a review game. Although I made up the game myself, it is similar to jeopardy where the students pick questions of different difficulty within a topic. The students are split up into teams, and if one group answers a question incorrectly other groups have an opportunity to steal the question. I absolutely love this game because the students work so well together in their groups and are extremely invested in each problem. They have smiles on their faces the entire time as well as they work meticulously to complete the problem within the time frame. The pure exhilaration of getting a question correct or having the opportunity to steal a question brings such a positive energy to the classroom. Every test that we have my students get excited because they know that means we get to play the “review game” the lesson beforehand. Mrs. Conroy: It has been a treat to return to the Geometry classroom. The biggest change in this class over the past three years has been the use of technology. Now that each student in the class has their own surface loaded with the geometer’s sketchpad software, the variety of classroom activities available to the class are remarkable. Each day feels different. We are discovering geometry through investigations, constructions and traditional class framework notes. My ability to project figures from a variety of sources has led to a much more efficient classroom. Students can see examples in one note as well as on the board and we are able to spend so much more classroom time doing problems. This has not gone unnoticed by my students. They enter class wondering what will we be doing today. Some things never change. Students love to find the missing angles but proofs remain a challenge! Mrs. Hill: My Topics class can be a bit of a raucous group. The students are all seniors who, for the most part, have not all had great success in mathematics. In this course, however, we are focusing on political and societal applications of mathematics, and the “math” kind of sneaks in under the radar. A young woman in that class has struggled in past math courses at the school, but has had tremendous results in this one due to her intense work ethic and willingness to participate. She talks about how she really understands the relevance of this course and can appreciate how math is used in the “real world.” It is so wonderful to see a person who, before now, has not seen a use for mathematics discovering how it can be relevant to her life. Mrs. Whipple: During a recent lesson on proving congruent triangles, students in my geometry honors class where given a new type of problem using overlapping triangles. They were put into groups and sent to the white boards to work together to come up with the most efficient ways to prove that certain triangles were congruent. Afterwards, we talked about all the strategies that each group used in tackling the problem and which worked best. After sharing all their ideas and observations, they were given another extremely hard proof to work on together. Not only did they use the strategies that we talked about but the majority of the groups commented on how “this problem was much easier”, when it was actually much more challenging. Ms. Briedis: In a recent class we were beginning a lesson on composite trig functions. The lesson started with absolute value functions and the students were amazed by how the absolute value of a trig function changed the way the graph looked. We began playing with trig functions such as f(x)=(x^2+1)sin(2pix), and they thought the graph was the incredible. The amazement on their faces was exactly what teachers thrive on. We began playing with different functions on Desmos.com, and each student began creating their own functions and then would share them with the class. We would then work on what the two functions would be that the overall function oscillated between. It was a really fun lesson that the students connected with. They were engaged and excited about the different functions they were creating and seeing from others. It was an overall thrilling time to see them so inspired about graphing. Mrs. Baldwin: Our class has been investigating random phenomena through use of examples and simulations. The students are doing a great job figuring out what makes a process truly random as opposed to arbitrary or haphazard. We have been noticing that the word “random” is used often in a casual sense in everyday language and have begun to recognize cases where the word is used inappropriately. Students did a great job with a recent project in which they found a probability estimate through a little research and conducted a simulation in which they used a random number generator (or table) to conduct repeated trials. One example involved estimating the number of attempts needed to catch a toy in the claw machine when there is an 8% chance of grabbing the toy on any single attempt. The student discovered, through 20+ repeated trials of this simulation that it took about 12 attempts on average. This corresponded with the estimate published on the website. We will next investigate the theory behind these random phenomena and connect the underlying principles to our observations. It has been great working with these students who bring enthusiasm and a lot of creativity to class. Mr. Matthias: Each year when the class starts Engineering & Robotics, they aren’t quite sure what they will be facing. There is some concern as we begin with a survey of Engineering and the Engineering process. Then, as we start ROBOTC programming, the class begins to feel more comfortable and confident about the material. We practice our programming with robots in “Engineering Labs” designed to give students practical experience with programming the movement of their robot to achieve certain goals. The Engineering Labs soon become one of the favorite activities of the class and students regularly ask if we are doing one in the day’s class. As a teacher, I am so thrilled that the class looks forward to this engaging hands-on learning activity. 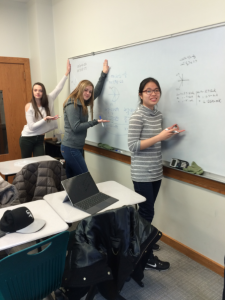 Mrs. McCullagh: Looking back at trimester 1, I am particularly pleased with how the students adjusted to the abstract nature of Calculus. In this course they are asked to use the skills they have built in Algebra, Geometry, and Pre-Calculus. To that we add the concepts of Calculus. While challenging, the students did really well in working with limits and longer problems than they had seen in the past. We spent a block of classes exploring the definition of the derivative. The students have a very good intuitive understanding of what we mean by derivative being the instantaneous rate of change.